Creeks and swamps are very common in that area. Somewhere in the Brazilina jungle we lost the license plate. I had to stop at a shop to build a replacement. Many wreckages like this can be seen everywhere in French Guyana, mostly in remote areas. Hundreds, if not even more! Some of them with broken glass and burned. We were wondering why. I found the answer while in the shop waiting for the replacement license plate to be cut. There was another client who had some strange tears on his pants. We began talking and he mentioned one day he was driving his Citroen Xsara from Cayenne to St. Georges. At some point, the road was blocked with tree branches. Feeling the danger, he placed the car in reverse and attempted to escape. That moment, two men armed with shotguns showed up from the jungle and opened fire. Some rounds broke the tires while others penetrated the door and hit his leg. Even though he was being fired upon several times, he did not stop. With flat tires he couldn’t go very far, but from his cell phone he alerted the Gendarmerie who came and rescued him and his vehicle. After telling this story, he lifted the pant sleeve to reveal the wounds! To get from French Guyana to Suriname I had to cross this river. I was happy to see a ferry waiting, but soon I learned it was out of order. So o canoe was the solution once again. The visit at the center lasted for about 3 hours. We moved by bus and visited two launch sites and two command centers. We learned there are 5 launch sites: Ariane 4 and Diamante 2 (both decommissioned), Ariane 5, Soyuz and Vega (last two under construction, to be completed by end of 2010). Three launch sites are needed so the space center will be able to accommodate all customers’ needs (regarding payload size and orbit type). The command centers were extremely silent, totally opposed to the agitation seen on TV. 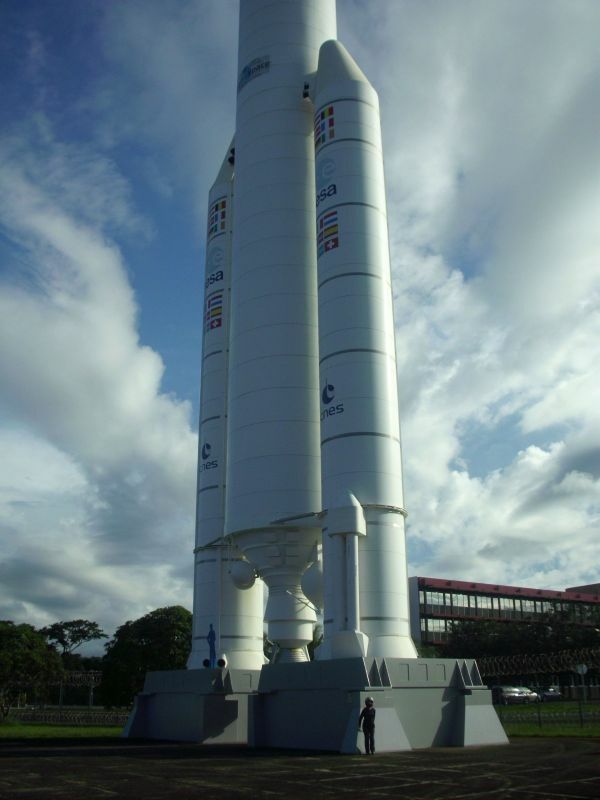 Pictures show: Parts/payload, in storage after shipped by plane; Ariane 4 launch site; Ariane 5 launch site; Centre de Lancement 3; Centre de Lancement 3. This weekend was very boring. In Cayenne, most stores remained closed, public library also closed, nobody on the street. So for Sunday I decided to move to Kourou, expecting a change. But there it was even worse: Sunday ar 2PM only aMcDonald’s and one gas station were open. Everything else was closed, even the movie theater! Absolutely nobody on the street. Just like in a deserted place! Fortunately, the public swimming pool was open so I was able to relax and practice there for an hour. In Kourou I found out food and accomodation are extremely expensive. A hamburger at McDonald’s was 5EUR (7.50EUR with meal) and the cheapest room available in town was 101EUR (three stars, single). So the tent saved me around 250EUR during this weekend! Monday I was scheduled for Space Center visit. The tour lasted for about three hours and it was free of charge. We visited the launch site for Ariane 4 (abandoned), Ariane 5 and the Jupiter control center. I will get back with some photos soon. Now I am back in Cayenne. If I will get the Suriname visa this afternoon, as planned, I will proceed immediately towards the border. Hopefully, by night I will be in Paramaribu. Since two days ago we are in Cayenne, French Guyana. Trying to sell Palomina here is less successful than expected. So today I applied for a visa for Suriname, from where there are more freight shipments to USA and hopefully I will be able to ship her home. In two hours Laura will be departing from the airport to Martinique, Paris and then Bucharest. In the meantime we visited the Space Museum at the Guyana Space Center and I booked a tour of the center for Monday morning.